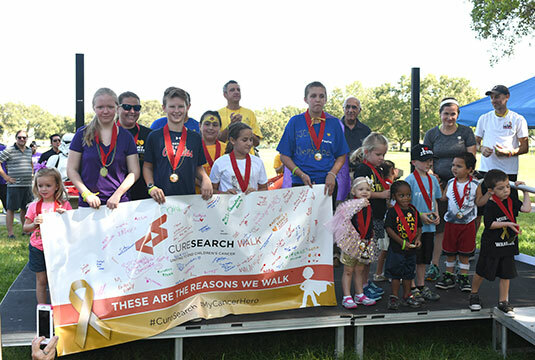 CureSearch Walks bring together families, friends and community members who walk and raise funds to support the most promising new children's cancer research. We walk to celebrate the kids who beat cancer, to support those currently fighting, and to remember those who lost their battle. 43 children are diagnosed with cancer every day; one in eight will not survive. For the children who survive, most will suffer long-term toxic side effects from current treatments. Building on 30 years of experience, CureSearch is leading the development of better, less-toxic treatments for the 40,000 children who will undergo treatment each year. Our goal is to save children, adolescents and young adults NOW and enable them to live long, healthy lives. Join us. Click here to learn more about our sponsors including National Sponsors and National Team Partners.